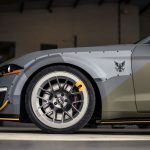 Ford Performance heeft samengewerkt met driftkampioen Vaughn Gittin Jr. om een unieke Eagle Squadron Mustang GT ter ere van de 100e verjaardag van de Royal Air Force te creeeren. Deze unieke Mustang wordt op 26 juli in Oshkosh, Wisconsin, geveilgd tijdens het AirVenture Charity Event. 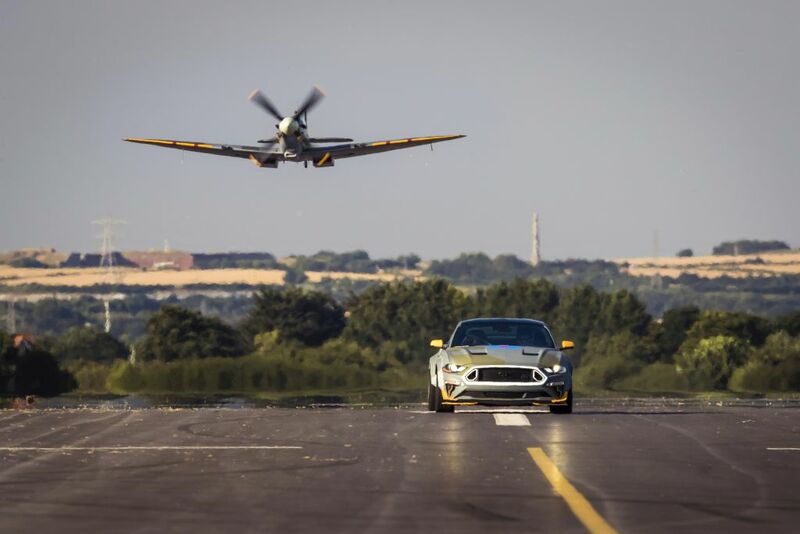 Tijdens het Goodwoood Festival of Speed is de Mustang voor het eerst worden getoond. 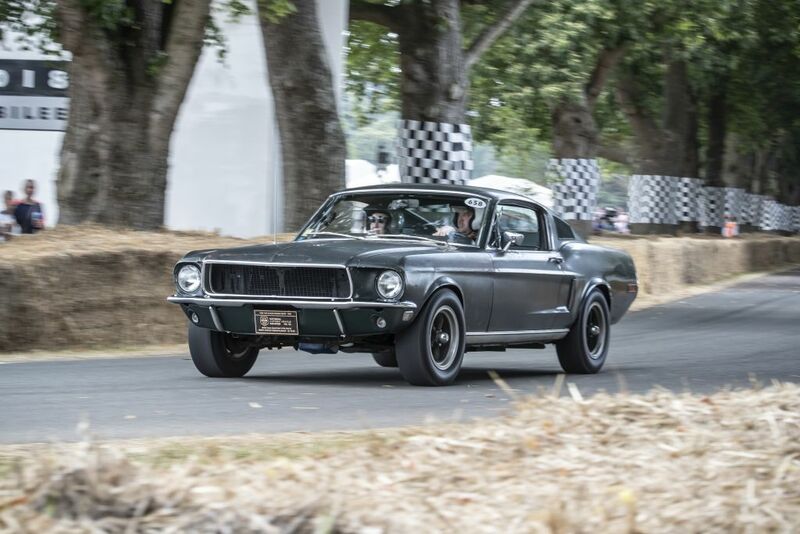 The iconic 1968 Ford Mustang GT driven by Steve McQueen in Warner Bros. Pictures’ classic film “Bullitt” – and lost to history until the beginning of this year – makes its first appearance outside of the U.S. at the 2018 Goodwood Festival of Speed, U.K. 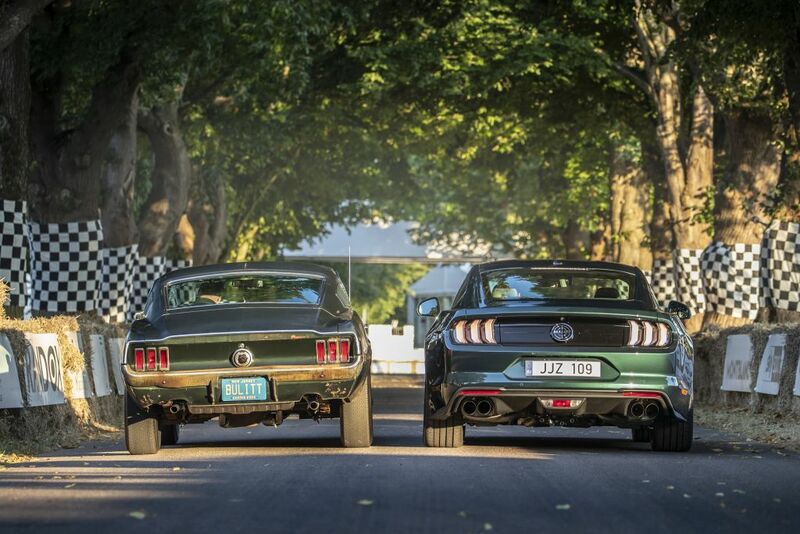 The car that starred in the Warner Bros. film’s legendary 10-minute chase sequence – setting the standard for every movie car chase to follow – features on the 1.16-mile (1.9-kilometre) Goodwood Hillclimb course accompanied by owner Sean Kiernan and alongside the new special edition Ford Mustang Bullitt that celebrates the 50th anniversary of the classic film. 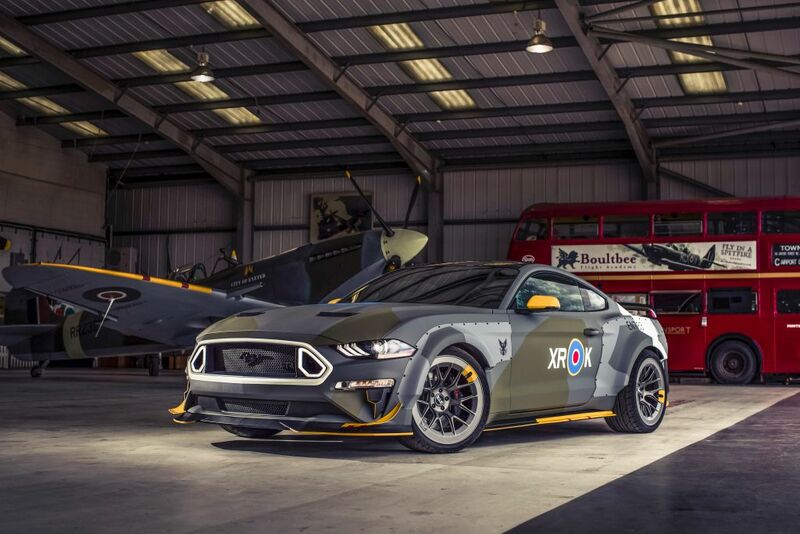 Another very special Ford Mustang is paying tribute at Goodwood to a group of U.S. volunteer pilots who flew combat missions alongside the Royal Air Force over Europe from nearby British airfields, prior to the U.S. entering World War II. 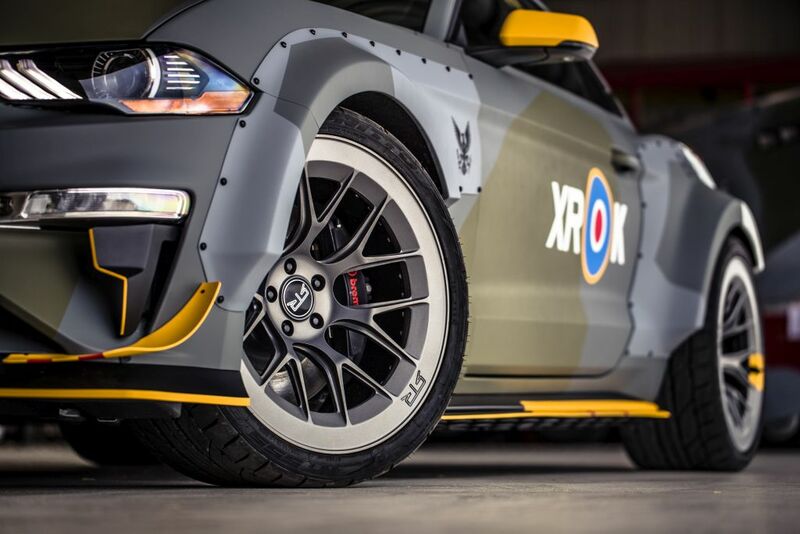 Driven up the Hillclimb by Vaughn Gittin Jr. – and co-created by Ford Performance and the world champion drifter’s RTR Vehicles – the Eagle Squadron Mustang GT features a one-off, fighter aircraft-inspired livery. 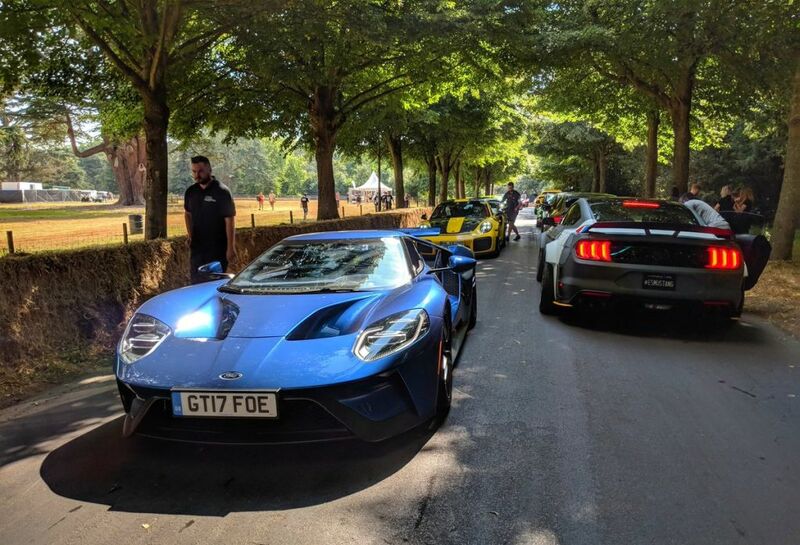 The ultra-high-performance Ford GT supercar returns to Goodwood piloted by Ford Chip Ganassi Racing Team World Endurance Championship drivers Andy Priaulx and Harry Tincknell fresh from the Le Mans 24 Hours race — as does Gittin Jr.’s Mustang RTR drift car. Two identical 1968 Mustang GT fastbacks were used in the filming of the classic Warner Bros. movie “Bullitt” that debuted in theatres on Oct. 17, 1968. After filming, the cars went their separate ways: the hero vehicle driven by McQueen in the movie was sold by Warner Bros. to a private buyer, and the other – used in many of the jumps during the famous chase scene – was sent to a salvage yard. That jumper vehicle resurfaced in Baja, California, in early 2017, but the other was lost to history… until earlier this year. Sean Kiernan, owner of the hero vehicle, inherited the car in 2014 from his late father, Robert, who had purchased the vehicle in 1974. 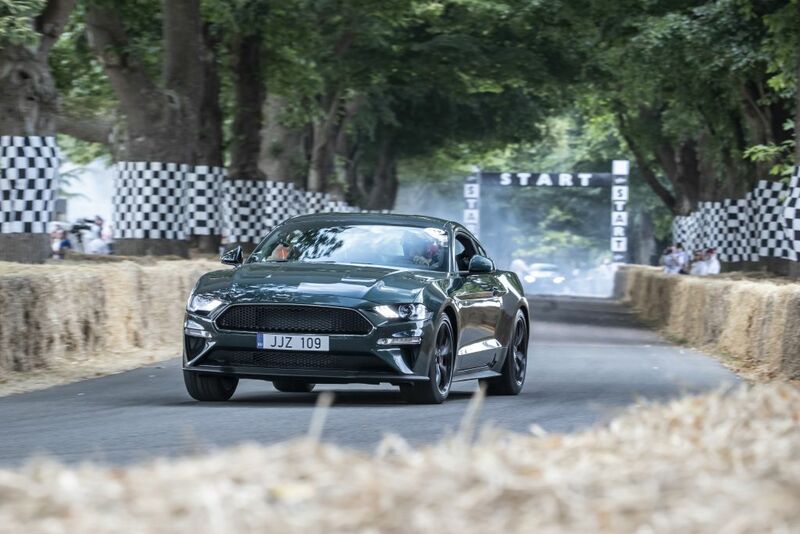 To fulfil his family’s lifelong dream, Sean contacted Ford and the two parties worked together to reveal his movie star car firstly at the 2018 North American International Auto Show in Detroit, and now at the 2018 Goodwood Festival of Speed, alongside the new Ford Mustang Bullitt that is now on sale across Europe. 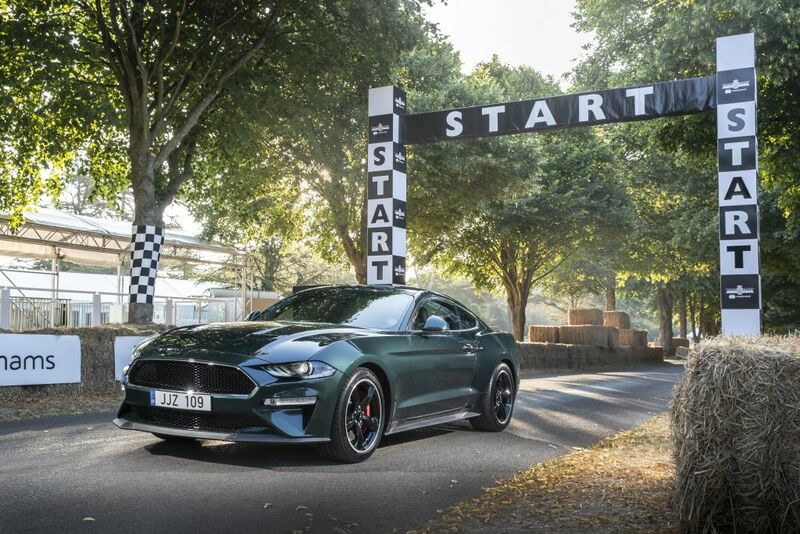 The new Mustang Bullitt is powered by Ford’s 5.0-litre V8 engine enhanced with an Open Air Induction System, and intake manifold, 87 mm throttle bodies and powertrain control module calibration from the Shelby Mustang GT350, to deliver 460 PS and 529 Nm of torque. * The six-speed manual transmission is equipped with Ford’s new rev-matching technology, which uses the engine’s electronic control system to briefly “blip” the throttle as the driver downshifts for smooth, seamless gear-changes. Offered with a choice of Shadow Black or classic Dark Highland Green exterior colours, the Mustang Bullitt features 19-inch Torq Thrust-style wheels, red Brembo™ brake callipers and a faux Bullitt fuel-filler cap. Other features that pay tribute to the car McQueen drove are subtle chrome accents around the grille and front windows, and a unique black front grille. 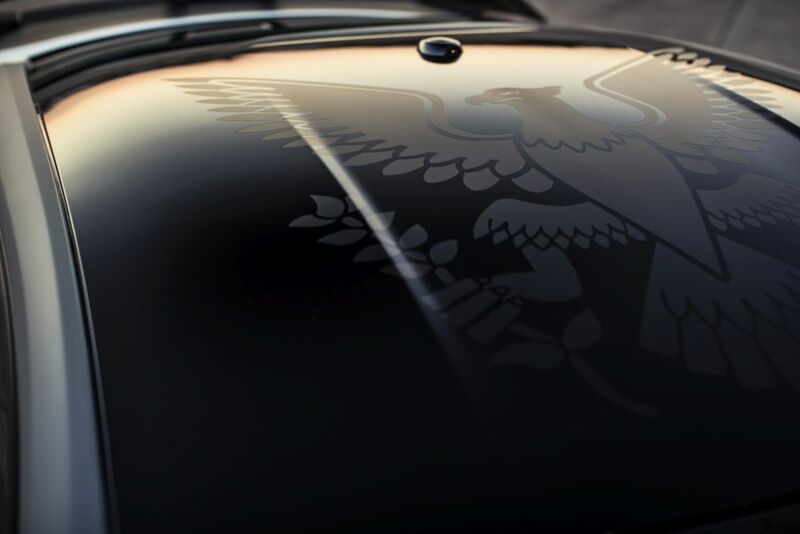 Inside and out, the vehicle uses minimal badging. The interior delivers Ford’s 12-inch all-digital LCD instrument cluster and, in addition to the standard seats that feature green stitching and a driver’s seat memory function, Mustang Bullitt customers can opt for black leather-trimmed Recaro® sports seats. As a nod to the original car’s interior, the gear shifter features a white cue ball gearshift knob. A premium B&O PLAY audio system that delivers 1000 watts through 12 high-performance speakers also features. 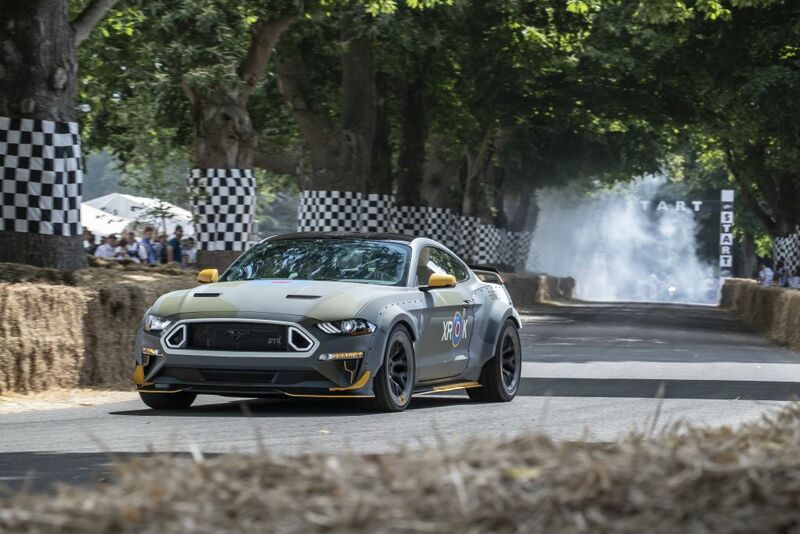 Vaughn Gittin Jr., returns to the Goodwood Hillclimb in his bespoke Mustang RTR drift car – producing more than 900 horsepower in competition form. However, this year it’s not the only Mustang in which Gittin Jr. is flying up the hill. 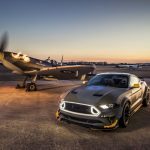 Gittin Jr. will pilot the 700 horsepower Eagle Squadron Mustang GT on the Hillclimb course before the unique sports car is returned to the U.S. to be auctioned at the Experimental Aircraft Association’s largest fundraiser, The Gathering – with proceeds supporting the Association’s youth education programmes. 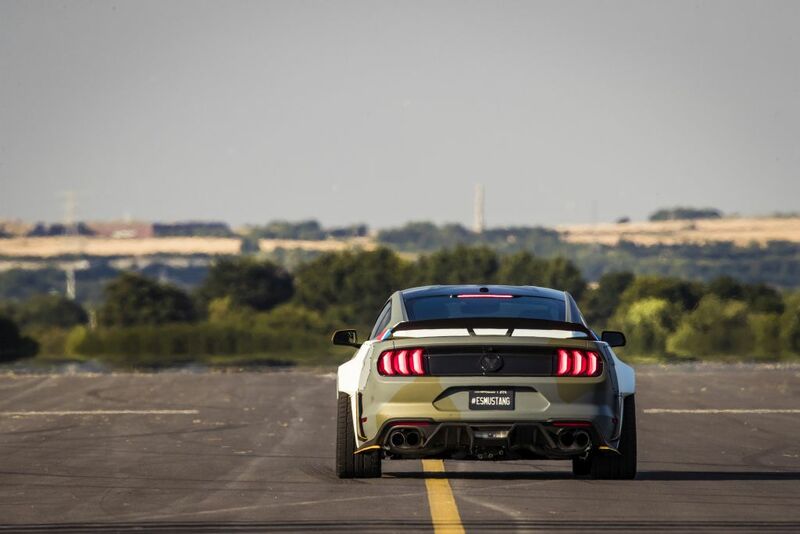 Powered by a 700-horsepower Ford 5.0-litre V8 with a Ford Performance supercharger, the unique Eagle Squadron Mustang GT features an RTR carbon-fibre wide-body kit – adding a powerful and menacing-looking to the camouflaged exterior, and a Tactical Performance suspension package for fine-tuned handling. 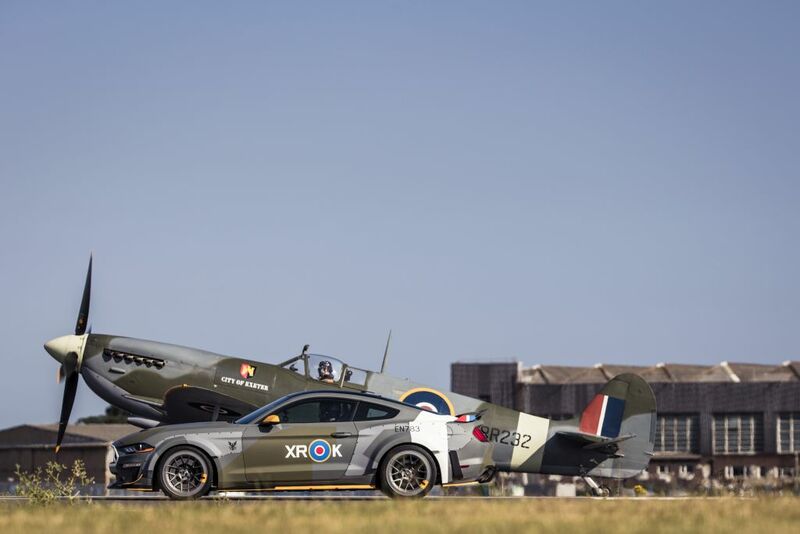 RAF veteran Paul Miller, whose father “Dusty” served in the Eagle Squadron in 1941 and 1942, will accompany Gittin Jr. as he recreates the fighter plane experience on the Goodwood Hillclimb course. 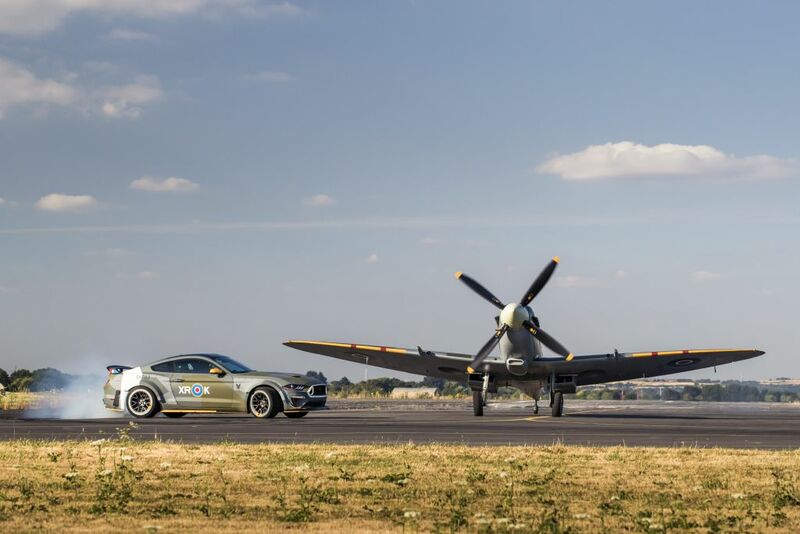 This year’s build is inspired by the Eagle Squadron, a group of U.S. volunteer pilots who flew combat missions alongside the Royal Air Force over Europe from British airfields near Goodwood prior to the United States entering World War II. 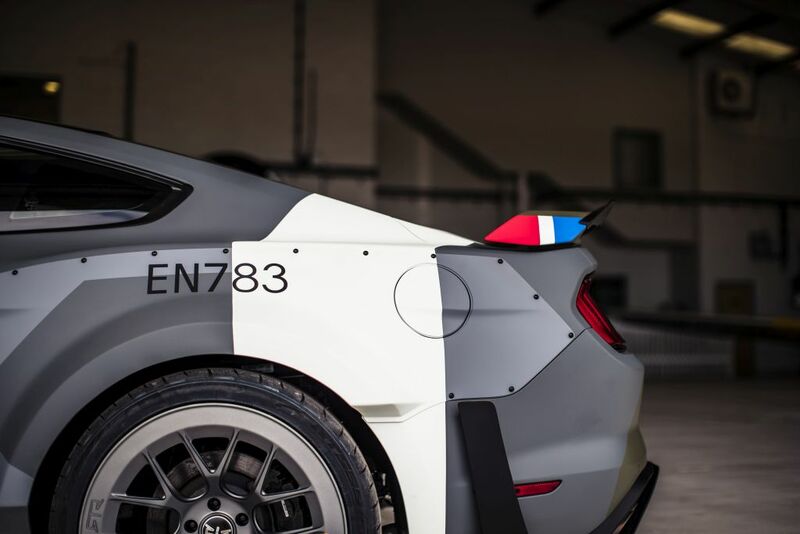 The car will be on display at the Ford booth at the Goodwood event this weekend. 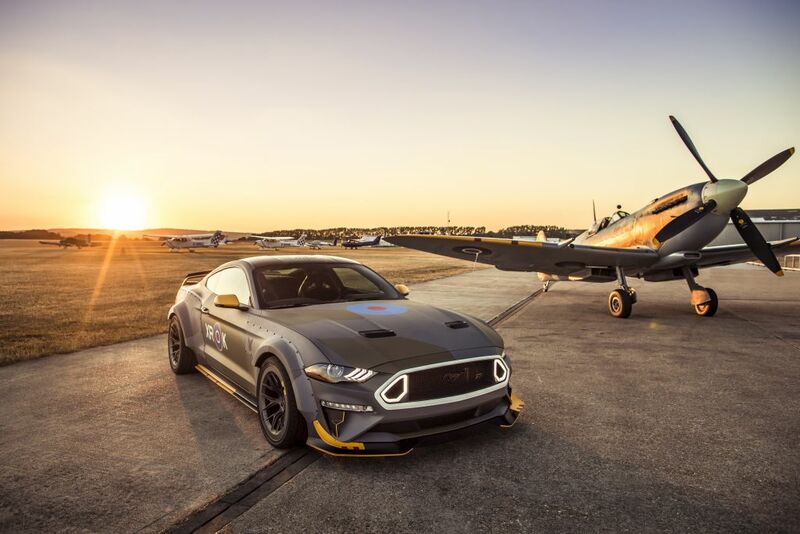 2018 marks the 20th year Ford has supported the Experimental Aircraft Association AirVenture event and the 10th one-off Mustang it has provided for auction. Notable Ford models inspired by other aviation legends include the 2011 Blue Angels and 2013 Thunderbirds editions. All auction proceeds will be donated to the Experimental Aircraft Association’s youth education programs and museum, which encourage and support the next generation of pilots. To date, Ford has worked with the organization to raise more than $3 million. Under the hood, a Ford Performance supercharger kit first introduced at the 2017 SEMA show helps the Ford 5.0-liter V8 churn out 700 horsepower and 610 lb.-ft. of torque at 12 psi of boost on 93-octane fuel. 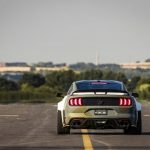 The engine is mated to a Tremec 6-speed manual transmission with Ford Performance short shifter, with power delivered to the road via a heavy-duty upgraded rear axle also supplied by Ford Performance. An RTR Tactical Performance Suspension Package – with MagneRide in-car adjustable dampers, Ford Performance lowering springs and RTR adjustable sway bars – increases grip and lateral acceleration. Staggered RTR Aero 7 two-piece forged wheels with 285/30 ZR20 front and 305/30 ZR20 rear Nitto NT555 tires help keep the beast firmly planted on terra firma. Aside from becoming the owner of this one-off Eagle Squadron Mustang GT, the high bidder will receive an all-expense-paid trip for two to Detroit in August to attend the 2018 Ford Woodward Dream Cruise and be presented with the car. Jack Pelton, CEO and chairman, Experimental Aircraft Association, said Ford has again stepped up to handsomely deliver in helping the next generation of pilots find new pathways to flight. 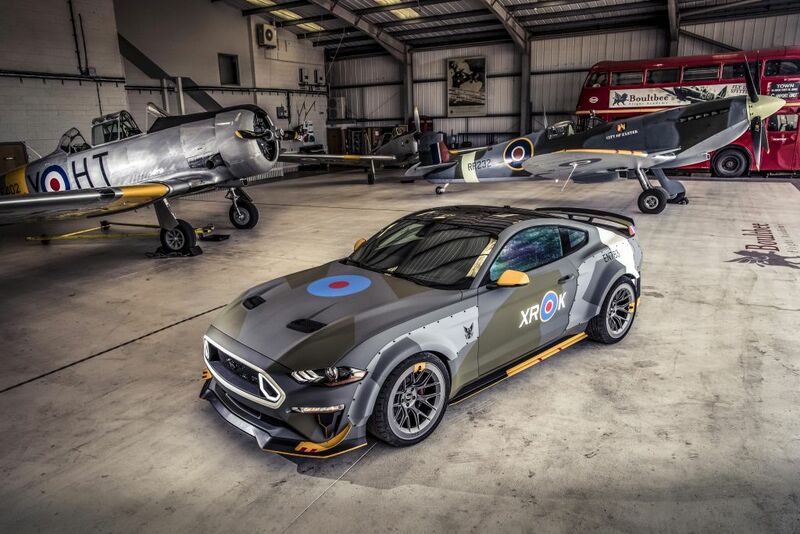 “With this Royal Air Force-inspired Mustang GT, Ford has again gone beyond our wildest expectations,” he said. 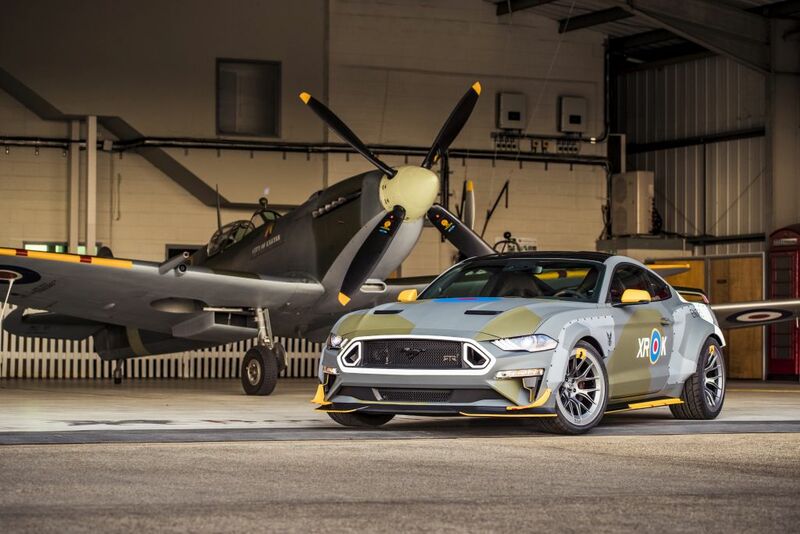 The Eagle Squadron Mustang GT will be auctioned off on July 26 at The Gathering, the annual charity event hosted at the Experimental Aircraft Association Aviation Museum. The charity supports the museum and youth aviation programs. To learn more about the Experimental Aircraft Association, its youth programs and The Gathering (including bidding on the Eagle Squadron Mustang GT), call 920.426.6573 or email gathering@EAA.org. Visitors to this year’s Goodwood Festival of Speed can also witness the ultra-high-performance Ford GT supercar tackle the Hillclimb, driven by Ford Chip Ganassi Racing Team drivers Andy Priaulx and Harry Tincknell – who secured a podium finish at last month’s Le Mans 24 Hours with the #67 Ford GT World Endurance Championship race-car. 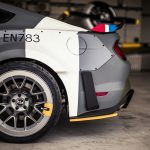 A road-going version of a the 2016 Le Mans-winner is powered by a twin-turbocharged 3.5-litre V6 EcoBoost engine that produces 655 PS and 750 Nm of torque,** delivering a top speed of 347 km/h (216 mph) – the highest for any Ford production vehicle to date. Active aerodynamics change on demand to match different driving conditions, using moveable elements around the body, including special ducts in the front, and a large deployable wing. Hydraulic suspension can adjust ride height for optimal performance, and drivers can easily adjust the car’s settings for different scenarios with five unique Drive Modes: Normal mode, Wet mode, Sport mode, Track mode and V-Max mode. Limited to just 250 examples per year, with four years of production confirmed, the Ford GT is among the world’s most exclusive supercars. The M-Sport Ford Fiesta WRC car has already delivered three rally wins for the M-Sport Ford World Rally Team so far this season; in Monte Carlo, Mexico and France. Taking a break from their preparations for the upcoming Rally Finland, the team’s drivers Sebastien Ogier – 2017 and five-time winner of the World Rally Drivers’ Championship, and Elfyn Evans – former British Rally Championship winner, are demonstrating the asphalt and loose surface performance of the rally-wining car at Goodwood. 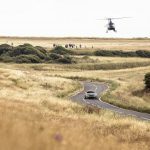 Ford earlier this year announced a new agreement to supply extended technical and financial support to long-term motorsport partner M Sport – winner of the FIA World Rally Championship Drivers’ and Manufacturers’ titles in 2017. 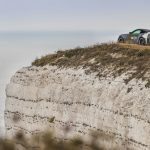 The M-Sport Ford Fiesta WRC is powered by a 1.6-litre EcoBoost engine developing 385 PS and 450 Nm of torque, and features a six-speed sequential gearbox and permanent four-wheel drive. In addition to the track and rally stage action, visitors to the Ford stand at Goodwood have the opportunity to discover the all-new Ford Focus. 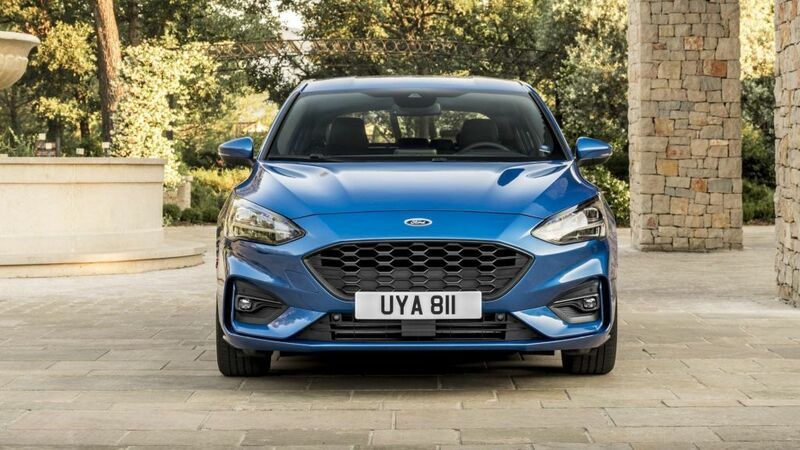 The most accomplished and technically-competent Focus ever is offered with a sophisticated range of Ford driver assistance technologies, including Adaptive Cruise Control with Stop & Go, Speed Sign Recognition and Lane-Centring for effortlessly negotiating stop-start traffic; Ford’s first Head-up display in Europe; and Active Park Assist 2, which operates gear selection, acceleration and braking to enable fully-automated manoeuvres at the push of a button. In addition, visitors will be able to explore Ford’s comprehensive sport utility vehicle line-up that includes the compact EcoSport, mid-sized Kuga and the flagship new Edge model, with advanced technologies including Post-Collision Braking – which helps to reduce the impact of a potential secondary collision by automatically applying moderate brake pressure when an initial collision event is detected; and Evasive Steering Assist – which helps drivers steer around stopped or slower vehicles to help avoid collisions. 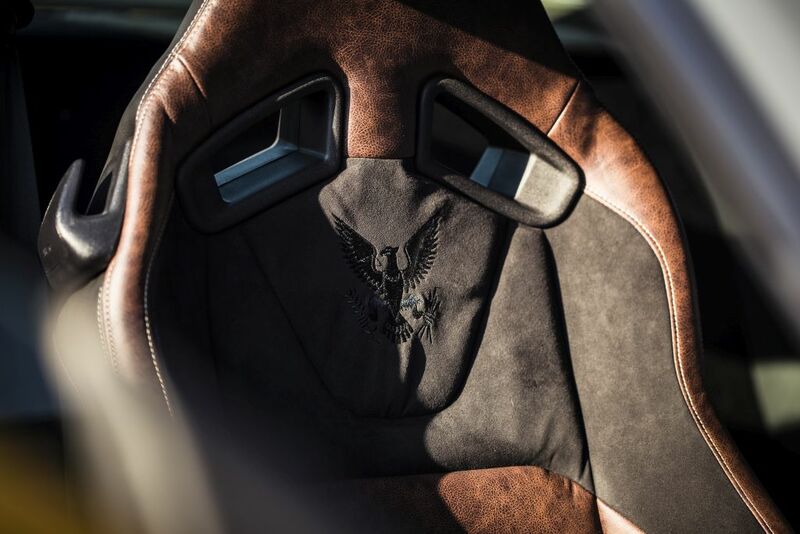 The three-story Ford Performance stand offers one of the finest views of the Goodwood festival, taking in both Goodwood House and the action on the track. The views can be further enhanced with Ford’s Spectator Binoculars at viewing hotspots across two floors. Celebrating the 50th anniversary of the Warner Bros. movie “Bullitt”, visitors to the Ford stand have the opportunity to star in their own “Bullitt” movie poster and trailer. Fans can channel their inner McQueen to recreate the iconic actor’s famous lean in a personalised movie poster, and get behind the wheel to star in a 60-second trailer in The Movie Studio. The Leap returns in 2018 — challenging visitors to launch themselves from a 4.5 metre airbag jump experience; and the popular Adrenalin Walk gives visitors a unique view of the stand using a suspended glass floor to offer views from every angle. Celebrating Ford’s partnership with the Team Sky elite cycling team, Ford also is hosting the Team Sky Skills Trackstand Challenge, a timed standing-stop balance competition. A team of parkour athletes will be ascending an experts-only 9 metre platform eight times a day to show the crowds how it’s done with a series of choreographed stunt falls, spins, flips and somersaults.